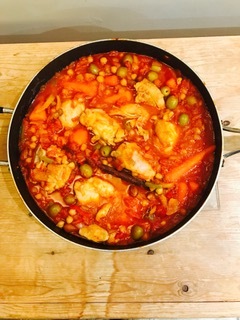 Clients have been asking me “Are tinned tomatoes dangerous?” I use tinned tomatoes in lots of my recipes like the tagine shown above. In this article I unpack the risks so that you can decide. Some people are concerned about the risks associated with Bisphenol A or BPA which is used in some plastic food containers and in the lining of food and drink cans. BPA may have the potential to interact with our hormone systems and possibly increase the risk of diseases like breast and prostate cancer. The European Food Safety Authority (EFSA) assessed the possibility that BPA could cause adverse health effects. As a result they reduced the tolerable daily intake (TDI) recommendation. The TDI is the estimated quantity that can be consumed over a lifetime without significant risk to health. People consuming food packaged in containers lined with BPA daily would take in considerably less BPA than the TDI. This means that there is no appreciable risk to health. So what are the benefits? Tinned tomatoes are one of your 5 a day, low in calories, fat and added sugar, a good source of fibre and an excellent source of vitamin A and C and the antioxidant lycopene. Lycopene is associated with lower risk of diseases like heart disease, some cancers and macular degeneration (poor eyesight in old age). Tinned tomatoes are a great source of good nutrition. However some people who remain concerned about the potential risks associated with BPA have switched to passata in jars. If you are risk averse then this may seem like a good move. However it’s important to remember that jars of passata contain much more salt than most tinned tomatoes. Salt is associated with raised blood pressure and increased risk of cardiovascular disease. So essentially you are swapping one risk for another. Fresh tomatoes are a healthy choice but unless you pick your tomatoes from your garden and use them immediately they will probably contain less vitamin C than the tinned option and they are lower in lycopene. So overall I’m encouraging the food industry to support further research into BPA but I’m happy that based on current evidence the health benefits of tinned tomatoes outweigh the risks. This entry was posted in Bite sized science and tagged BPA, processed foods, tinned tomatoes by Stephanie.fade. Bookmark the permalink.